Summary: Although rare, syncope may result from metastasis to the retropharyngeal or parapharyngeal space and involve or invade the glossopharyngeal nerve or internal carotid artery. We report the CT and MR imaging findings in four patients with syncope that preceded the diagnosis of recurrent squamous cell carcinoma in the pericarotid region. These findings suggest that recurrent carcinoma should be ruled out when a patient with head and neck malignancy and syncope is postoperatively examined. Syncope is caused by a wide variety of problems that range from common benign disorders to severe life-threatening disease. Even when an extensive evaluation of syncope is undertaken, identifying its cause is difficult (1). Syncope as a result of head and neck malignancy is rare (2–8). MacDonald et al (3) estimated that the incidence of syncope caused by head and neck tumors was less than one in 250 patients in a review of approximately 4500 cases. We conducted a retrospective review of all patients who were seen in our institute between 1982 and 1999 and who had syncope because of recurrent head and neck cancer. Approximately 1200 patients with head and neck cancer were seen at our institute during that period. Four patients were identified. Little information is available regarding imaging studies in cases of syncope caused by head and neck malignancy. Our purpose was to present the CT, MR imaging, and clinical findings in patients with syncope and head and neck cancer. A 72-year-old man with a history of squamous cell carcinoma of the buccal mucosa was treated with radical surgery 6 years previously; squamous cell carcinoma of the supraglottis was diagnosed. His tumor was stage (T4N1M0) with involvement of the oropharynx. He underwent bilateral neck dissection and pharyngolaryngectomy with reconstruction by means of a microvascular free jejunal flap. After surgery, he received radiation therapy with a total of 40 Gy to the entire neck. Five months later, episodic syncope occurred, especially after severe cough attacks. At physical examination, no recurrence of the tumor in the neck and pharynx was apparent. The patient did not have a history of syncope, although he previously had ischemic heart disease. Brain CT and EEG findings were normal. An echocardiogram revealed moderate reduction of the left ventricular systolic function owing to previous myocardial infarction. Also, 24-hour cardiac Holter monitoring showed no sinus arrest but occasional premature ventricular contractions. With carotid sinus massage on the left side of the neck, the patient’s blood pressure decreased from 160/90 mm Hg to 120/80 mm Hg, and the pulse rate decreased from 60 beats per minute to 58 beats per minute. 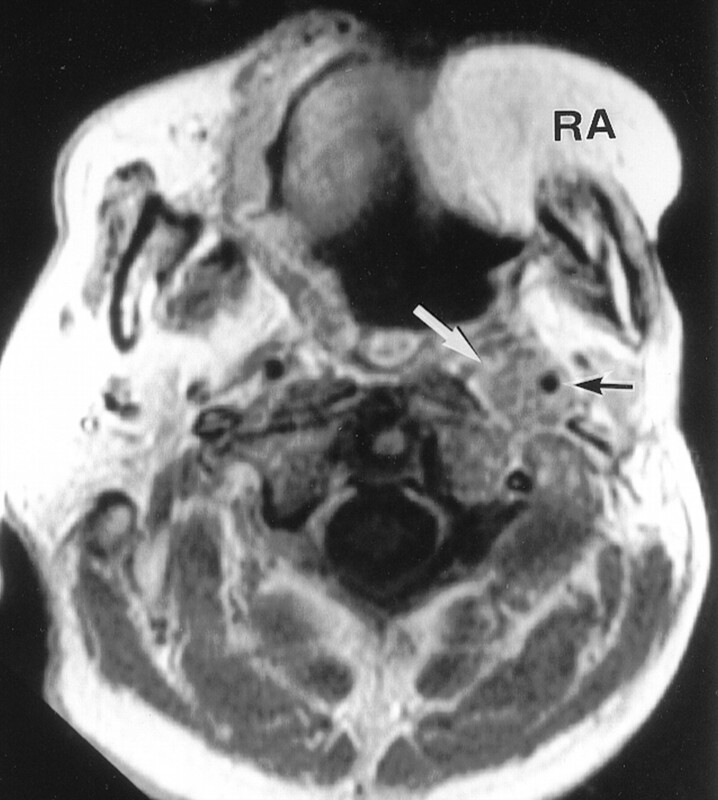 MR imaging of the head and neck showed that multiple left retropharyngeal lymph node metastases encased the left internal carotid artery (ICA) (Fig 1). Several pressor agents were administered, but none was effective. After initiation of chemotherapy with cisplatin and 5-fluorouracil, the frequency of the syncopal attacks seemed to decrease, but they continued. Subsequent MR imaging, which was performed twice at 3-month intervals, showed that the metastatic mass increased in size. The patient died from cardiac failure 19 months after surgery. No autopsy was performed. Case 1. Axial T1-weighted contrast-enhanced MR image (350/8 [TR/TE]) obtained through the soft palate shows a mass (white arrow) that extends into the parapharyngeal space and encases the left ICA (black arrow). Note a rectus abdominal musculocutaneous flap (RA), which was used during previous surgery to reconstruct the defect caused by buccal cancer. A 60-year-old man had a diagnosis of squamous cell carcinoma of the base of the tongue. His tumor was stage (T4N2cM0), with right retropharyngeal lymph node metastases. The patient underwent bilateral neck dissection and pharyngolaryngectomy with reconstruction by means of a free microvascular forearm flap. Although several large metastatic retropharyngeal lymph nodes seemed to adhere to the right carotid bifurcation in preoperative images, they could be peeled off the carotid artery. After surgery, the patient underwent radiation therapy for possible microscopic residues, with a total of 60 Gy to the entire neck. Three months later, the patient had severe right-sided facial pain followed by loss of consciousness, and sometimes, tonic seizures with incontinence. Every syncopal episode usually accompanied facial pain and lasted approximately 30 seconds to a few minutes. Brain CT and EEG findings were normal. At physical examination, no recurrence of the tumor in the neck and pharynx was apparent. A 90° head-up tilting test performed for 10 minutes to screen for neurocardiogenic syncope did not show vasovagal reflex, but transient orthostatic dizziness was observed, and the patient’s blood pressure decreased from 105/68 mm Hg to 67/35 mm Hg with a slight increase in heart rate. Carotid sinus massage did not notably cause a decrease in either blood pressure or pulse rate. Such attacks became more frequent after daily physical examination, during which the oropharyngeal wall was stretched with a tongue depressor or neck palpation; these maneuvers seemed to trigger syncope. The attacks subsequently occurred without provocation. The tentative diagnosis of glossopharyngeal neuralgia with syncope was made. Therapy with carbamazepine and pressor agents was unsuccessful in relieving the patient’s symptoms. 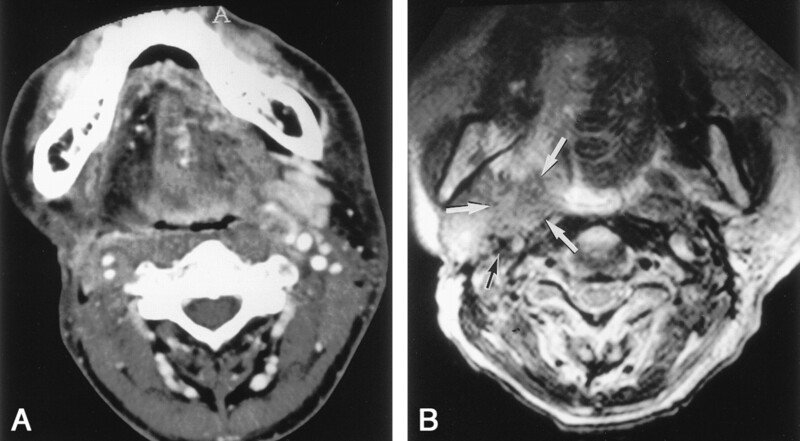 Approximately 2 weeks after medical treatment, an MR image of the head and neck revealed swelling of a retropharyngeal lymph node on the right side, with involvement of the right ICA (Fig 2); this involvement was located beyond the previous surgical field. One month after the onset of syncope, multiple cervical lymph node metastases in the right neck appeared. The patient died because of tumor progression from the right parapharyngeal space to the intracranial cavity 8 months after surgery. No autopsy was performed. Case 2. Axial T1-weighted contrast-enhanced MR image (600/20) shows a lateral retropharyngeal lymph node metastasis (white arrow) that surrounds the right ICA (black arrow). A 42-year-old man had a diagnosis of squamous cell carcinoma of the hypopharynx. His tumor was stage (T4N2cM0), with right retropharyngeal lymph node metastases. The patient underwent bilateral neck dissection and pharyngolaryngectomy with reconstruction by means of a microvascular free jejunal flap. Although several large metastatic retropharyngeal lymph nodes seemed to adhere to the right carotid bifurcation in preoperative images, we were able to remove these nodes from the carotid artery by exfoliating the adventitia of the carotid artery. After surgery, a dose of 40 Gy was delivered to the entire neck. Approximately 8 months after surgery, the patient had episodes of loss of consciousness and convulsions associated with severe right facial pain. Massage of either carotid sinus did not produce bradycardia or hypotension. Initially, a CT scan revealed no evidence related to this symptom (Fig 3A). However, the patient’s symptom gradually progressed. Three months later, subsequent MR imaging revealed that a large recurrent tumor with undefined margin was present in the right retropharyngeal and parapharyngeal spaces (Fig 3B). Because the tumor was located in the previous surgical field, it might have arisen from microscopic residue in the pericarotid region, and then it progressed in the neck. One year 6 months after the surgery, he died from head and neck cancer. No autopsy was performed. A, Axial contrast-enhanced CT scan obtained through the oropharynx shows asymmetry of the parapharyngeal space, which was believed to be a result of surgery. Note the low-attenuating area on the right half of the tongue that represents denervated muscle atrophy and increased fat after resection of the right hypoglossal nerve. B, Axial T2-weighted MR image (3500/110) obtained 3 months later shows that an abnormal mass (white arrows) with intermediate signal intensity replaces most of the retropharyngeal and parapharyngeal spaces, with involvement of the right ICA (black arrow). A 60-year-old man had a diagnosis of squamous cell carcinoma of the hypopharynx. His tumor was stage (T3N1M0). He underwent bilateral neck dissection and pharyngolaryngectomy with reconstruction by means of a microvascular free jejunal flap. After surgery, he received radiation therapy to the entire neck at a dose of 40 Gy. Eighteen months later, he had episodic syncope without pain. After admission to the hospital for an evaluation of syncopal episodes, the patient was found to have hypotension and bradycardia. However, massage of either carotid sinus produced no reaction. No preexisting cardiac problem had been noted. 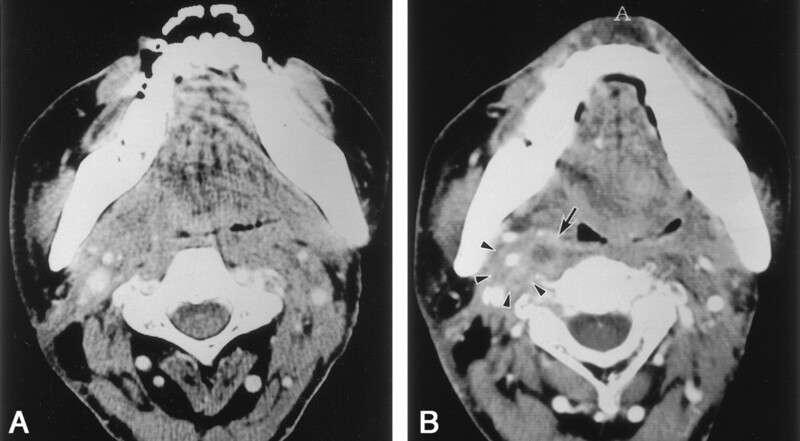 An initial contrast-enhanced CT scan showed no discrete lymphadenopathy in the neck (Fig 4A). Three months later, a repeat contrast-enhanced CT scan revealed an enlarged node with a central hypoattenuated area in the right retropharyngeal space (Fig 4B). The patient then began a chemotherapy regimen with cisplatin and 5-fluorouracil. He was less symptomatic but died owing to massive hemorrhage in the transferred jejunum, which was probably induced by tumor invasion 2 years 3 months after surgery. No autopsy was performed. A, Axial contrast-enhanced CT scan obtained through the oropharynx shows asymmetry of the parapharyngeal space, which was thought to be a result of surgery. 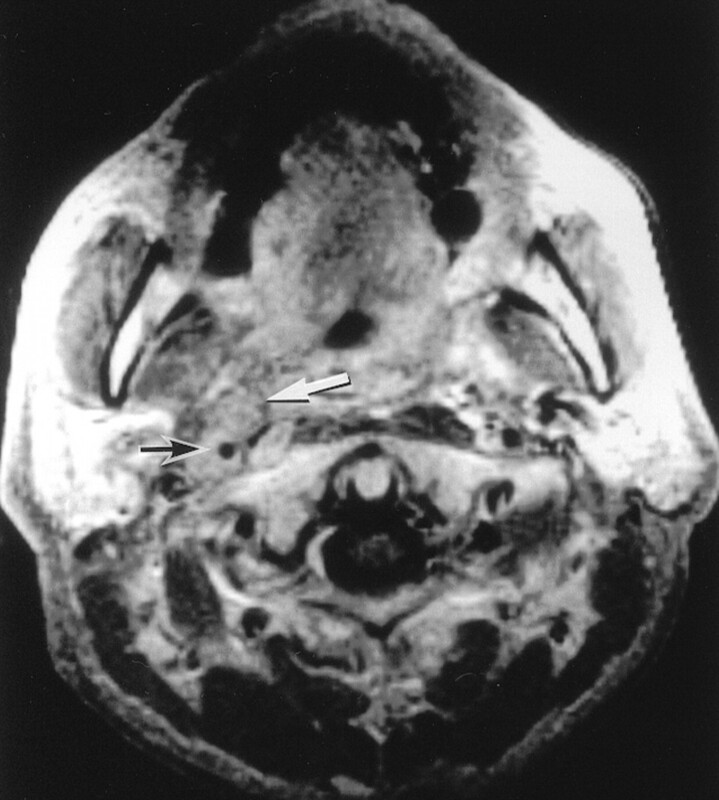 B, Axial contrast-enhanced CT scan obtained 3 months later shows an enlarged retropharyngeal lymph node with central necrosis (arrow) and involvement of the right ICA (arrowheads). We describe cases involving four patients with syncope who presented at the early stages of recurrent carcinoma of the head and neck. Metastatic retropharyngeal nodes with involvement of the ICA were present in all patients; this finding suggests that the glossopharyngeal-vagal reflex arch was responsible for their syncope. The glossopharyngeal nerve has sensory components, including somatic afferents that supply sensation to the mucous membranes of the pharynx, tonsillar region, and back of the tongue. It also includes general visceral afferents that supply the blood pressure receptors of the carotid sinus. The carotid sinus is a baroreceptor present in the adventitia of the carotid artery where afferent myelinated fibers proceed along the nerve of Herring to join the glossopharyngeal nerve and then proceed to the dorsal motor nucleus of the vagus in the medulla oblongata. This glossopharyngeal-vagal reflex arch results in hypotension and bradycardia leading to syncope. This report included different types of syncope caused by occult metastatic squamous cell carcinoma in the retropharyngeal and parapharyngeal spaces. The most common cardiovascular reflex syndromes related to malignancy of the head and neck are carotid sinus hypersensitivity syndrome (2–5) and glossopharyngeal neuralgia with syncope (3, 6). In the present study, case 1 involved the only patient who had hypersensitivity to carotid massage and cough syncope, as Wenger et al (9) described. The MR images in this case showed that the left ICA was displaced laterally and encased by a recurrent tumor that was larger than that seen in other patients. One possible explanation is that the ICA was sensitive to the elevation of arterial pressure induced by coughing. The patients in cases 2 and 3 had clinical courses similar to that of a patient with glossopharyngeal neuralgia with syncope, whose case Dykman et al (6) described in 1981. In our two patients, syncope was not secondary to hypersensitivity to carotid massage. In glossopharyngeal neuralgia, trigger points for pain may be present, usually in the oropharynx or the face. The pain may be triggered by some irritating lesions, such as those caused by infection, trauma, and foreign body impaction in the neck (10). In case 3, a trigger was not identified, but in case 2, daily physical examination performed with a tongue depressor and palpation of the neck stretched the oropharyngeal wall; these maneuvers might have resulted in an attack. Moreover, the tumor growing in the pericarotid region might have led to the attacks without provocation. In addition, Cicogna et al (7) have proposed a new cardiovascular syndrome: parapharyngeal space-lesion syncope syndrome. They state that this syndrome is different from carotid sinus hypersensitivity syndrome or glossopharyngeal neuralgia with syncope. Six of 11 patients in their study had neither neuralgia nor hypersensitivity in response to carotid massage; this observation is similar to the presentation in our case 4. Although Cicogna et al stressed that their proposed syndrome is a discrete entity, several reports (5, 6) described syncope induced by tumor in the parapharyngeal space before the publication of their article. Moreover, as described in this report, similar lesions in retropharyngeal and parapharyngeal spaces induced different symptoms. The features of syncope can vary according to the progression of the tumor in the pericarotid region, among patients and also throughout the clinical course of an individual patient. Weiss and Baker (2) described the mechanical compression of the carotid sinus as a cause of syncope in patients with a head and neck tumor. As previously mentioned, severe compression of the ICA was present in case 1, with carotid sinus hypersensitivity syndrome. However, syncope in our patients cannot be explained by this compression theory alone, because syncope preceded identification of the mass in two patients in whom carotid massage did not induce syncope. Lin et al (8) reported two patients with frequent syncopal attacks and nasopharyngeal carcinoma involving the parapharyngeal space. They proposed that parapharyngeal space lesions irritate the afferent fibers of the glossopharyngeal nerve and produce syncope by means of the cardiovascular reflex through the afferent nerve of Herring. The exact mechanism of syncope in our patients remains unclear because of the lack of histologic proof. However, findings in our cases suggest that retropharyngeal lymph node metastasis has the potential to cause syncope, perhaps not only by compressing the glossopharyngeal nerve but also by irritating the nerve in the early stage. This mechanism may provide an explanation for the delay between symptom onset and the depiction of tumor recurrence on the images. Many factors involve the glossopharyngeal nerve to produce symptoms. Autopsy findings (4) in patients with squamous cell carcinoma reveal that tumor invasion, together with a tissue reaction due to irradiation, chemotherapy, inflammation, and direct pressure, probably account for the irritation of the carotid sinus. Moreover, from a review of 17 patients with syncope, MacDonald et al (3) suggested that an initial radical neck dissection that opens the carotid sheath (a relatively good barrier against invasion by cancer) creates a pathway by which a recurrent tumor can invade the carotid arterial wall and sinus and cause syncope. All of our patients had recurrent tumors surrounding the ICA after neck dissection. A mass in the retropharyngeal or parapharyngeal space is often asymptomatic and fairly large when the patient of physician initially notices it. Symptoms referable to cranial nerves IX-XII may also initially occur without any palpable cervical mass. None of our patients had a palpable cervical mass at the beginning of the recurrence of their tumor. Imaging is the chief diagnostic tool when the lesions in these spaces are suspected. However, Morrissey et al (11) recently reported that the accuracy of CT in determining the presence of metastases in retropharyngeal lymph nodes is low. Moreover, the evaluation of recurrent tumors after neck dissection and reconstructive procedures is more difficult than such evaluation before surgery (12). In the present report, the histologic diagnosis of the mass in the retropharyngeal and parapharyngeal spaces was not performed because of the difficulty in accessing the tumor. However, clinical and radiologic findings revealed that the tumors were metastatic squamous cell carcinomas. Moreover, because of the poor prognosis of this entity, which is caused by a malignant disease (3), no further surgical procedures were attempted in our patients. We report cases in four patients with syncope that was associated with occult metastatic squamous cell carcinoma in the retropharyngeal and parapharyngeal spaces. The mechanism of syncope may be a cardiovascular reflex linked to invasion of the glossopharyngeal nerve adjacent to the ICA. Careful and repeated investigation of the retropharyngeal space and parapharyngeal space should be required when a patient with head and neck malignancy presents with syncope. Accepted after revision April 2, 2002.